For other uses, see Samsara (disambiguation). Saṃsāra (Sanskrit, Pali; also samsara) in Buddhism is the beginning-less cycle of repeated birth, mundane existence and dying again. Samsara is considered to be dukkha, unsatisfactory and painful, perpetuated by desire and avidya (ignorance), and the resulting karma. Rebirths occur in six realms of existence, namely three good realms (heavenly, demi-god, human) and three evil realms (animal, ghosts, hellish). [note 1] Samsara ends if a person attains nirvana,[note 2] the "blowing out" of the desires and the gaining of true insight into impermanence and non-self reality. In Buddhism, saṃsāra is the "suffering-laden cycle of life, death, and rebirth, without beginning or end". It is the never ending repetitive cycle of birth and death, in six realms of reality (gati, domains of existence), wandering from one life to another life with no particular direction or purpose. [note 3] Samsara is characterized by dukkha ("unsatisfactory," "painful"). [note 4] Every rebirth is temporary and impermanent. In each rebirth one is born and dies, to be reborn elsewhere in accordance with one's own karma. It is perpetuated by one's avidya ("ignorance"), particularly about anicca and anatta, and from craving. [note 5] Samsara continues until moksha is attained by means of insight and nirvana. [note 2] the "blowing out" of the desires and the gaining of true insight into impermanence and non-self reality. The Saṃsāra doctrine of Buddhism asserts that while beings undergo endless cycles of rebirth, there is no changeless soul that transmigrates from one lifetime to another - a view that distinguishes its Saṃsāra doctrine from that in Hinduism and Jainism. This no-soul (no-self) doctrine is called the Anatta or Anatman in Buddhist texts. The early Buddhist texts suggest that Buddha faced a difficulty in explaining what is reborn and how rebirth occurs, after he innovated the concept that there is "no self" (Anatta). Later Buddhist scholars, such as the mid-1st millennium CE Pali scholar Buddhaghosa, suggested that the lack of a self or soul does not mean lack of continuity; and the rebirth across different realms of birth – such as heavenly, human, animal, hellish and others – occurs in the same way that a flame is transferred from one candle to another. Buddhaghosa attempted to explain rebirth mechanism with "rebirth-linking consciousness" (patisandhi). The mechanistic details of the Samsara doctrine vary within the Buddhist traditions. Theravada Buddhists assert that rebirth is immediate while the Tibetan schools hold to the notion of a bardo (intermediate state) that can last up to forty-nine days before the being is reborn. 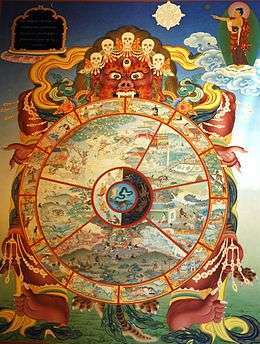 A thangka showing the bhavacakra with the ancient five cyclic realms of saṃsāra in Buddhist cosmology. Medieval and contemporary texts typically describe six realms of reincarnation. Buddhist cosmology typically identifies six realms of rebirth and existence: gods, demi-gods, humans, animals, hungry ghosts and hells. Earlier Buddhist texts refer to five realms rather than six realms; when described as five realms, the god realm and demi-god realm constitute a single realm. Gods realm: the gods (devas) is the second realm, and typically subdivided into twenty six sub-realms. A rebirth in this heavenly realm is believed to be from very good karma accumulation. A Deva does not need to work, and is able to enjoy in the heavenly realm all pleasures found on earth. However, the pleasures of this realm lead to attachment (Upādāna ), lack of spiritual pursuits and therefore no nirvana. Vast majority of Buddhist lay people, states Kevin Trainor, have historically pursued Buddhist rituals and practices motivated with rebirth into Deva realm. [note 6] The Deva realm in Buddhist practice in southeast and east Asia, states Keown, include gods found in Hindu traditions such as Indra and Brahma, and concepts in Hindu cosmology such as Mount Meru. Human realm: called the manuṣya realm. Buddhism asserts that one is reborn in this realm with vastly different physical endowments and moral natures because of a being's past karma. A rebirth in this realm is considered as fortunate because it offers an opportunity to attain nirvana and end the Saṃsāra cycle. Demon, Anti-god or Demi-god realm: the demi-gods (asuras) is the third realm of existence in Buddhism. Asura are notable for their anger and some supernormal powers. They fight with the Devas (gods), or trouble the Manusya (humans) through illnesses and natural disasters. They accumulate karma, and are reborn. Animal realm: is state of existence of a being as an animal (tiryag). This realm is traditionally thought to be similar to a hellish realm, because animals are believed in Buddhist texts to be driven by impulse and instinct, they prey on each other and suffer. Some Buddhist texts assert that plants belong to this realm, with primitive consciousness. Hungry ghost realm: hungry ghosts and other restless spirits (preta) are rebirths caused by kamma of excessive craving and attachments. They do not have a body, are invisible and constitute only "subtle matter" of a being. Buddhist texts describe them as beings who are extremely thirsty and hungry, very small mouths but very large stomachs. Buddhist traditions in Asia attempt to care for them on ritual days every year, by leaving food and drinks in open, to feed any hungry ghosts nearby. When their bad karma demerit runs out, these beings are reborn into another realm. This realm is considered in Buddhist texts to be the mildest of the three evil realms. Hell realm: beings in hell (naraka) enter this realm for evil karma such as theft, lying, adultery and others. The texts vary in their details, but typically describe numerous hellish regions each with different forms of intense suffering, such as eight extremely hot hellish realms, eight extremely cold, being partially eaten alive, beating and other forms of torture in proportion to the evil karma accumulated. These beings are reborn in another realm after their evil karma has run its course, they die, and they get another chance. This realm is not similar to afterlife hell in Christianity, states Damien Keown, because in Buddhism there is no realm of final damnation and existence in this realm is also a temporary state. Thus acts of body and speech are driven by an underlying intention or will (cetanā), and they are unwholesome or wholesome because they are motivated by unwholesome or wholesome intentions. Acts of body and speech are, then, the end products of particular kinds of mentality. At the same time karma can exist as a simple 'act of will', a forceful mental intention or volition that does not lead to an act of body or speech. Inconsistencies in the oldest texts show that the Buddhist teachings on craving and ignorance, and the means to attain liberation, evolved, either during the lifetime of the Buddha, or there-after. [note 10] According to Frauwallner, the Buddhist texts show a shift in the explanation of the root cause of samsara. Originally craving was considered to be the root cause of samsara,[note 11] which could be stilled by the practice of dhyana, leading to a calm of mind which according to Vetter is the liberation which is being sought. Samsara ends when one attains moksha, liberation. In early Buddhism, Nirvana, the "blowing out" of desire, is moksha. In later Buddhism insight becomes predominant, for example the recognition and acceptance of non-self, also called the anatta doctrine. One who no longer sees any soul or self, concludes Walpola Rahula, is the one who has been liberated from the samsara suffering cycles. [note 17] The theme that Nirvana is non-Self, states Peter Harvey, is recurring in early Buddhist texts. Some Buddhist texts suggest that rebirth occurs through the transfer of vinnana (consciousness) from one life to another. When this consciousness ceases, then liberation is attained. There is a connection between consciousness, karmic activities, and the cycle of rebirth, argues William Waldron, and with the destruction of vinnana, there is "destruction and cessation of "karmic activities" (anabhisankhara, S III, 53), which are considered in Buddhism to be "necessary for the continued perpetuation of cyclic existence." While Buddhism considers the liberation from samsara as the ultimate spiritual goal, in traditional practice, Buddhists seek and accumulate merit through good deeds, donations to monks and various Buddhist rituals in order to gain better rebirths rather than nirvana. In some Buddhist traditions, rebirth is envisioned to occur in more than six realms of existence. Above ten realms depiction in Vietnam. Gethin argues, rebirth in the different realms is determined by one's karma, which is directly determined by one's psychological states. 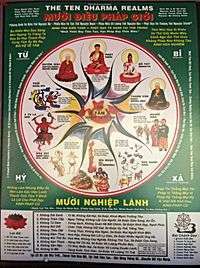 The Buddhist cosmology may thus be seen as a map of different realms of existence and a description of all possible psychological experiences. The psychological states of a person in current life lead to the nature of next rebirth in Buddhist cosmology. Paul Williams acknowledges Gethin's suggestion of the "principle of the equivalence of cosmology and psychology," but notes that Gethin is not asserting the Buddhist cosmology is really all about current or potential states of mind or psychology. The realms in Buddhist cosmology are indeed realms of rebirths. Otherwise rebirth would always be into the human realm, or there would be no rebirth at all. And that is not traditional Buddhism, states Williams. David McMahan concludes that the attempts to construe ancient Buddhist cosmology in modern psychological terms is modernistic reconstruction, "detraditionalization and demythologization" of Buddhism, a sociological phenomenon that is seen in all religions. ↑ Earlier Buddhist texts refer to five realms rather than six realms; when described as five realms, the god realm and demi-god realm constitute a single realm. Kevin Trainor: "Buddhist doctrine holds that until they realize nirvana, beings are bound to undergo rebirth and redeath due to their having acted out of ignorance and desire, thereby producing the seeds of karma". Conze: "Nirvana is the raison d’être of Buddhism, and its ultimate justification." Damien Keown: "Although Buddhist doctrine holds that neither the beginning of the process of cyclic rebirth nor its end can ever be known with certainty, it is clear that the number of times a person may be reborn is almost infinite. This process of repeated rebirth is known as saṃsāra or 'endless wandering', a term suggesting continuous movement like the flow of a river. All living creatures are part of this cyclic movement and will continue to be reborn until they attain nirvana." Ajahn Sucitto: "This continued movement is [...] what is meant by samsāra, the wandering on. According to the Buddha, this process doesn't even stop with death—it's like the habit transfers almost genetically to a new consciousness and body." Chogyam Trungpa: "Samsara arises out of ignorance and is characterized by suffering." Rupert Gethin: "This precisely is the nature of saṃsāra: wandering from life to life with no particular direction or purpose." Chogyam Trungpa states: "Cyclic existence [is] the continual repetitive cycle of birth, death, and bardo that arises from ordinary beings' grasping and fixating on a self and experiences. (...) Samsara arises out of ignorance and is characterized by suffering." Note that Chogyam Trungpa's description includes a reference to the bardo, or intermediate state, that is emphasized in the Tibetan tradition. ↑ Other scholars note that better rebirth, not nirvana, has been the primary focus of a vast majority of lay Buddhists. This they attempt through merit accumulation and good kamma. Sogyal Rinpoche states: "The kind of birth we will have in the next life is determined, then, by the nature of our actions in this one. And it is important never to forget that the effect of our actions depends entirely upon the intention or motivation behind them, and not upon their scale." Rupert Gethin: "What determines in which realm a being is born? The short answer is karma (Pali kamma): a being’s intentional ‘actions’ of body, speech, and mind—whatever is done, said, or even just thought with definite intention or volition. In general, though with some qualification, rebirth in the lower realms is considered to be the result of relatively unwholesome (akuśala/akusala), or bad (pāpa) karma, while rebirth in the higher realms the result of relatively wholesome (kuśala/kusala), or good (puṇya/puñña) karma." Paul Williams: "short of attaining enlightenment, in each rebirth one is born and dies, to be reborn elsewhere in accordance with the completely impersonal causal nature of one's own karma; this endless cycle of birth, rebirth, and redeath is Saṃsāra." ↑ Aṅguttara Nikāya III.415: "It is "intention" that I call karma; having formed the intention, one performs acts (karma) by body, speech and mind. ↑ Padmasambhava: "If you want to know your past life, look into your present condition; if you want to know your future life, look at your present actions." ↑ Frauwallner (1953), as referenced by Vetter (1988), Flores (2009), and Williams, Tribe and Wynne (2012). ↑ Tillmann Vetter: "Very likely the cause was the growing influence of a non-Buddhist spiritual environment·which claimed that one can be released only by some truth or higher knowledge. In addition, the alternative (and perhaps sometimes competing) method of discriminating insight (fully established after the introduction of the four noble truths) seemed to conform so well to this claim." According to Bronkhorst, this happened under influence of the "mainstream of meditation," that is, Vedic-Brahmanical oriented groups, which believed that the cessation of action could not be liberating, since action can never be fully stopped. Their solution was to postulate a fundamental difference between the inner soul or self and the body. The inner self is unchangeable, and unaffected by actions. By insight into this difference, one was liberated. To equal this emphasis on insight, Buddhists presented insight into their most essential teaching as equally liberating. What exactly was regarded as the central insight "varied along with what was considered most central to the teaching of the Buddha." ↑ In the Nikayas the four truths are given as the "liberating insight" which constituted the awakening, or "enlightenment" of the Buddha. When he understood these truths, he was "enlightened," and liberated, as reflected in Majjhima Nikaya 26:42: "his taints are destroyed by his seeing with wisdom." Typically, the four truths refer here to the eigthfold path as the means to gain liberation, while the attainment of insight in the four truths is portrayed as liberating in itself. 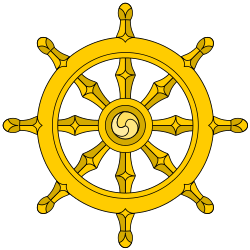 ↑ Phra Thepyanmongkol: "The designation that is Nibbana [Nirvana] is anatta (non-self)", states Buddha, in Parivara Vinayapitaka. ↑ Trainor 2004, p. 58, Quote: "Buddhism shares with Hinduism the doctrine of Samsara, whereby all beings pass through an unceasing cycle of birth, death and rebirth until they find a means of liberation from the cycle. However, Buddhism differs from Hinduism in rejecting the assertion that every human being possesses a changeless soul which constitutes his or her ultimate identity, and which transmigrates from one incarnation to the next..
↑ Juergensmeyer & Roof 2011, p. 271-272. ↑ McClelland 2010, p. 172, 240. ↑ Williams, Tribe & Wynne 2012, p. 18–19, chapter 1. 1 2 Buswell 2004, p. 711-712. 1 2 Buswell & Gimello 1992, p. 7–8, 83–84. 1 2 Choong 1999, p. 28–29, Quote: "Seeing (passati) the nature of things as impermanent leads to the removal of the view of self, and so to the realisation of nirvana.". 1 2 3 Rahula 2014, p. 51-58. ↑ Laumakis 2008, p. 97. 1 2 3 Gethin 1998, p. 119. 1 2 Ajahn Sucitto 2010, pp. 37-38. 1 2 Keown 2000, Kindle locations 702-706. 1 2 Chogyam Trungpa 2009, p. 137. 1 2 Williams 2002, pp. 74-75. 1 2 3 Keown 2004, pp. 81, 281. 1 2 3 Fowler 1999, p. 39–42. ↑ Trainor 2004, p. 62–63. ↑ Conze 2013, p. 71. ↑ Naomi Appleton (2014). Narrating Karma and Rebirth: Buddhist and Jain Multi-Life Stories. Cambridge University Press. pp. 76–89. ISBN 978-1-139-91640-0. ↑ David J. Kalupahana (1975). Causality: The Central Philosophy of Buddhism. University Press of Hawaii. pp. 115–119. ISBN 978-0-8248-0298-1. ↑ David J. Kalupahana (1975). Causality: The Central Philosophy of Buddhism. University Press of Hawaii. p. 83. ISBN 978-0-8248-0298-1. ↑ William H. Swatos; Peter Kivisto (1998). Encyclopedia of Religion and Society. Rowman Altamira. p. 66. ISBN 978-0-7619-8956-1. ↑ Bruce Mathews (1986). Ronald Wesley Neufeldt, ed. Karma and Rebirth: Post Classical Developments. State University of New York Press. pp. 123–126. ISBN 978-0-87395-990-2. ↑ James McDermott (1980). Wendy Doniger, ed. Karma and Rebirth in Classical Indian Traditions. University of California Press. pp. 168–170. ISBN 978-0-520-03923-0. ↑ Robert Buswell & Donald Lopez 2013, pp. 49-50, 708-709. ↑ McClelland 2010, pp. 40, 107. ↑ Bryan J. Cuevas; Jacqueline Ilyse Stone (2007). The Buddhist Dead: Practices, Discourses, Representations. University of Hawaii Press. pp. 118–119. ISBN 978-0-8248-3031-1. 1 2 Dalai Lama 1992, pp. 5-8. 1 2 Patrul Rinpoche 1998, pp. 61-99. ↑ Keown 2013, pp. 35-40. 1 2 3 4 5 6 7 8 9 10 Trainor 2004, p. 62. 1 2 3 4 5 6 McClelland 2010, p. 136. ↑ Keown 2013, pp. 36-37. 1 2 3 Trainor 2004, p. 63. 1 2 3 4 Keown 2013, p. 36. ↑ McClelland 2010, p. 114, 199. ↑ Harvey 1990, p. 39. 1 2 Sogyal Rinpoche 2009, p. 97. ↑ Gethin 1998, p. 120. ↑ Rupert Gethin (1998). The Foundations of Buddhism. Oxford University Press. p. 120. ISBN 978-0-19-289223-2. 1 2 Vetter 1988, p. xxi. ↑ Flores 2009, p. 63–65. ↑ Williams, Tribe & Wynne 2012, p. 33-34. 1 2 Vetter 1988, p. xxi-xxxvii. 1 2 Bronkhorst 1993, p. 93-111. ↑ Edelglass 2009, p. 3-4. ↑ Laumakis 2008, p. 136. ↑ Williams, Tribe & Wynne 2012, p. 46–47. ↑ Gombrich 1997, p. 99-102. ↑ Vetter 1988, p. xxxii, xxxiii. 1 2 Bronkhorst 1993, p. 54-55, 96, 99. ↑ Vetter 1988, p. xxxiii. ↑ Bronkhorst 1993, p. chapter 7. ↑ Bronkhorst 1993, p. 99-100, 102-111. ↑ Bronkhorst 1993, p. 108. ↑ Bhikkhu Nanamoli (translator) 1995, p. 268. ↑ Williams, Tribe & Wynne 2012, pp. 30–42. ↑ Robert Buswell & Donald Lopez 2013, pp. 304-305. ↑ Peter Harvey (2015). Steven M. Emmanuel, ed. A Companion to Buddhist Philosophy. John Wiley & Sons. pp. 26–44. ISBN 978-1-119-14466-3. ↑ Ted Honderich (2005). The Oxford Companion to Philosophy. Oxford University Press. pp. 113, 659. ISBN 978-0-19-103747-4. ↑ Melford E. Spiro (1982). Buddhism and Society: A Great Tradition and Its Burmese Vicissitudes. University of California Press. p. 84. ISBN 978-0-520-04672-6. ↑ Phra Thepyanmongkol (2012). A Study Guide for Right Practice of the Three Trainings. Wat Luang Phor Sodh. pp. 412–418. ISBN 978-974-401-378-1. ↑ Peter Harvey (2015). Steven M. Emmanuel, ed. A Companion to Buddhist Philosophy. John Wiley & Sons. pp. 36–37, Note: Harvey clarifies that non–Self does not mean "no–self", but denial of Self or "I" or 'I am' is clearly a vital soteriological idea in Buddhism. ISBN 978-1-119-14466-3. 1 2 Waldron 2003, p. 22. ↑ Michael D. Coogan (2003). The Illustrated Guide to World Religions. Oxford University Press. p. 192. ISBN 978-0-19-521997-5. 1 2 Williams 2002, pp. 78-79. ↑ David L. McMahan (2008). The Making of Buddhist Modernism. Oxford University Press. pp. 45–48, 57–58. ISBN 978-0-19-972029-3. , Quote: "Clearly, the interaction of Buddhism with psychology exhibits aspects of both detraditionalization and demythologization as already described. In addition, the legitimacy that is granted Buddhism in its reconstrual as a kind of psychology reverberates back to the very conception of Buddhism among Buddhists themselves, (...)"
John Bowker (2014). God: A Very Short Introduction. Oxford University Press. pp. 84–86. ISBN 978-0-19-870895-7. Cohen, Robert S. (2006). Beyond Enlightenment: Buddhism, Religion, Modernity. Routledge.